At O’Grady’s Landscape, we design, build, and install custom hardscapes in North Arlington, working hand-in-hand with each client to create a custom design they’ll love. Our hardscape services include all types of landscape masonry work, so we can build anything from patios to walls to stone fireplaces and more, depending on your wants and needs. What’s more, you’ll have access to an experienced landscaping team that produces each hardscape through thoughtful design and careful craftsmanship. Ready to see the difference O’Grady’s Landscape can make to your home? 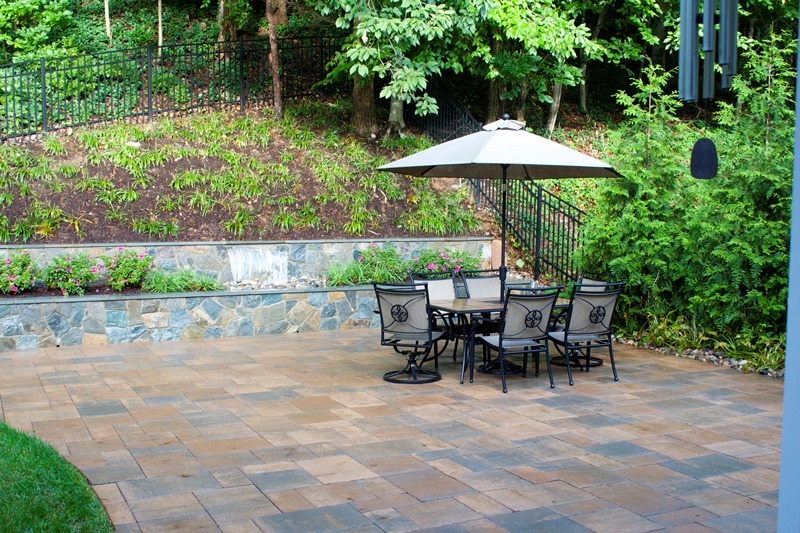 Request a consultation today or call us at 703-533-5001 for custom hardscapes in North Arlington, VA.
No matter what type of hardscape you’re looking for, O’Grady’s Landscape has the skills and product selection to bring your vision to life. The process begins when you request a proposal and we provide you with an initial design consultation. At this time, one of our landscape designers will perform an initial assessment of your space to discuss your ideas with you and determine what’s feasible. We’ll then offer recommendations based on your style and budget requirements, as well as the site evaluation, and provide estimates for your approval. After your hardscape design is installed, we can also provide you with ongoing landscape maintenance and lawn care services that will keep your landscape looking beautiful for years to come. From pruning and mulching to fertilization, we’ve got all your needs covered. After all, every gorgeous hardscape needs a well groomed yard to complement it! 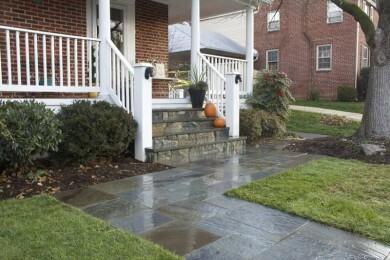 Looking for hardscape design and installation services in North Arlington, VA? Look no further than O’Grady’s Landscape! Our landscape designers, craftsmen, and project managers will work together to build your dream patio or outdoor kitchen, accomplishing your design goals while simultaneously maximizing functionality. We can also include outdoor lighting in your hardscape design or install landscape plants around it to enhance its beauty—the options are endless! “We decided to call in some landscape pros after buying a new house in North Arlington where the builder had not done much in the way of landscaping. The house had a basic sidewalk, no real patio in the backyard and few plants. I talked to our neighbors and it seemed that O’Grady’s was the landscaper of choice, so I gave them a call. Terry came out to look at what we had and to give us ideas for the yard. We didn’t know what we wanted other than a large patio and more colorful plants. Terry spent time walking through the yard getting a feel for what we wanted. O’Grady’s Landscape is a full-service landscape company in the North Arlington area that’s offered a range of design, build, and maintenance services to homeowners since 1991. By provide a wide variety of landscaping services, excellent project management, and reliable customer support services, we serve as a one-stop-shop for all of your landscaping needs.